The weapon was ready, a simple fission device similar to the bomb that destroyed Hiroshima. It had been finally assembled in a rented storage space on the outskirts of Las Vegas. Gulbuddin Hekmatyar had spent years quietly contemplating while meticulously planning this diabolical, logistically challenging mission. Among other things, the plot necessitated recruiting and directing a number of operatives, some technically skilled, located in several countries. All were individuals devoted to his cause and committed to the Jihadist goal of detonating a nuclear bomb in an American city. He chose Las Vegas because the city epitomized western decadence. The bomb’s essential component – 140 pounds of highly enriched uranium (HEU) – had been stolen or secretly purchased, bit-by-bit, mostly from Pakistan, but also from India, North Korea, Russia, Ukraine and Kazakhstan. It took years to collect, hide and safeguard all the necessary HEU in northwest Pakistan. From there, small pieces of the fissile material and some structural bomb components, hidden and well shielded in multiple shipments, were transported to U.S. ports or border crossings, and eventually to Las Vegas and the rented storage space. With all the components covertly acquired or fabricated by dedicated Jihadists in Pakistan and the United States, the relatively simple bomb finally could be assembled. It was comprised of a long, large-bore, artillery-type barrel; a heavy-duty breech; and enough chemical explosive to propel an appropriately shaped, 70-pound HEU piece through the barrel at very high velocity into another appropriately shaped, 70-pound piece of HEU affixed to the end of the barrel. Slamming together these two sub-critical masses would create the critical mass needed for an explosive chain reaction. It was time. The plan of attack was straightforward and foolproof. Weighing under a ton and less than a dozen feet long, the weapon in its lead-lined crate fit easily inside a small, rented truck. A lone, suicidal operative drove and parked the truck near the Strip, then activated the electronic device triggering the detonator that set off the chemical explosion. The HEU bullet accelerated through the barrel and merged almost instantaneously with the target HEU. Within microseconds, the critical mass exploded, releasing kilotons of energy, a blinding, rapidly expanding ball of light, heat and deadly radiation. A shock wave propagated through the atmosphere, flattening almost every building within a half-mile of the detonation point. Tens of thousands were dead or injured. Las Vegas was in ruins. The threat had become reality. When President Obama declared in 2009 that “nuclear terrorism is the most immediate and extreme threat to global security,” it was scarcely noticed. Yet when questionable sources announced that the Mayan Calendar predicted the end of the world in 2012, media and public attention was astonishing. The apocalyptic prediction arising from myth took hold, while a warning of potential catastrophe based in reality, put forth by Barack Obama in Prague, passed us by. 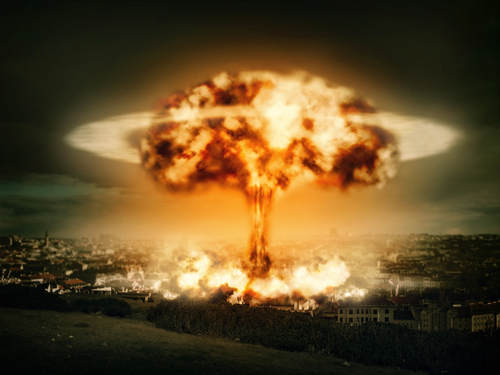 Supernatural doomsday scenarios readily gain traction in our public discourse, but threats to our civilization from proven nuclear dangers elude us. The public and press largely ignored other sobering news in 2010 when Wikileaks revealed that a 2009 cable from the U.S. Ambassador to Pakistan, Anne W. Patterson, warned that “our major concern is not having an Islamic militant steal an entire weapon, but rather the chance someone working in government of Pakistan facilities could gradually smuggle out enough enriched uranium to eventually make a weapon.”1)“Nuclear Fuel Memos Expose Wary Dance With Pakistan,” New York Times, November 30, 2010. By raising the specter of nuclear terrorism, the Wikileaks revelation gave concrete urgency to President Obama’s abstract concerns. But few paid attention, in part because few understand nuclear weapons risks and realities. Passage of time and reluctance to think the unthinkable have generated complacency. No nuclear weapon has been used aggressively since the August 9, 1945, attack on Nagasaki. Despite the existence of vast numbers of nuclear weapons, Americans expect nuclear restraint because they believe Mutually Assured Destruction (MAD) is a reliable deterrent. MAD presumably ensures that a country first using nuclear weapons will be wiped out by a retaliatory blow. But if a non-state entity were to perpetrate a nuclear weapons attack, at whom and where would retaliation be directed? An act of nuclear terrorism would obviate 69 years of stability engendered by MAD, an appropriately chosen topic of satirical banter in the film “Dr. Strangelove,” yet a grim reality. Obama’s words that nuclear terrorism is an “immediate and extreme threat” are not an exaggeration. Terrorists now have new opportunities to covertly fabricate nuclear weapons on their own, and the threat is compounded by the potential anonymity of the attackers. The cable allegedly sent by Ambassador Patterson leads to several questions: what is enriched uranium and how available is it? How is it used in a bomb, and who could use it? Where and how could it be delivered? What would be its effect? And perhaps the first and biggest question – why would terrorists aspire to manufacture, deploy, and detonate a nuclear weapon? The 9/11 attacks marked the beginning of a “Terrorist Era” with a capital T. That triple attack profoundly disturbed, shocked and injured the nation, psychologically as well as physically. It suggested that a goal of certain terrorists is the destruction of the United States and its allies, and nuclear capability would make that goal attainable. Thus the “why” can be revenge for the deaths of Muslim civilians or Osama bin Laden, Jihadist punishment of a decadent, anti-Islamic civilization, or retribution for western support of Israel. Still, the easily stated words “nuclear revenge” are not readily internalized. Unlike “tsunami” or “colon cancer,” the term “nuclear terrorism” does not usually evoke a visceral reaction. Such a response is unlikely until people intellectually and emotionally comprehend the potential threat of rogue nuclear weapons. And comprehension requires some understanding of the bomb itself. The Pentagon hypothesizes terrorist scenarios, but the public does not. Our opening Las Vegas scenario attempts to focus the reader’s mind on the real potential for nuclear catastrophe. Uranium can exist in different forms or “isotopes,” but all isotopes of uranium contain 92 positively charged protons in the nucleus with 92 negatively charged electrons dancing around the nucleus. These charged particles determine uranium’s chemical properties. However, the uranium nucleus also can contain varying numbers of uncharged neutrons. Somewhat greater than ninety-nine percent of uranium found in nature – uranium isotope 238 – has 146 neutrons in the nucleus. Thus the isotope’s 92 protons and 146 neutrons account for its atomic weight of 238. Uranium-235, with only 143 neutrons, is the dangerous isotope –because it tends to easily fission if it absorbs a neutron. The fissioning of U-235 powered the bomb that exploded over Hiroshima. Fortunately this isotope is very rare; less than one percent of all forms of uranium found in the earth consist of U-235. Uranium can create an explosive chain reaction—only if U-235 is in highly concentrated form, which is extremely difficult to obtain as described later. But first we explain the basics of nuclear bomb design. During the Manhattan Project, the great challenge was collecting and concentrating fissionable U-235. Because U-238 and U-235 have identical chemical properties, separation can only be achieved by exploiting the slight difference in mass arising from one isotope having three more neutrons than the other. One method of separation for enrichment purposes was developed using electric and magnetic forces in a modified form of the cyclotron called the calutron. A second method involved creating a compound in gaseous form of uranium and fluorine, then passing the gas through successive microscopic filters making use of the principle of diffusion. After the Second World War, improved centrifuges emerged as a more efficient method for enriching uranium. A Dutch company, which became part of the Urenco consortium that also includes Germany and the United Kingdom, was an early adopter of the improved centrifuge technology. Commercial production of enriched uranium for nuclear power plants became a worldwide activity. A. Q. Khan, a Pakistani metallurgist working at the Dutch facility, stole the centrifuge design drawings and brought the technology to Pakistan by the mid-1970s. Throughout the 1980s to the early 2000s, he then sold enrichment equipment to Iran, North Korea, and Libya, and had a vast network of suppliers in at least a dozen other countries. Having used these centrifuge designs to enable large-scale production of enriched uranium, today Pakistan is rapidly achieving status as having one of the largest and fastest growing stockpile of nuclear weapons after the United States, Russia and China. While some nuclear-armed countries are reducing their weapons count, Pakistan has a vigorous program of nuclear weapons development. Its stockpile is thought to have 100 to 200 nuclear weapons.4)See FAS’s world nuclear forces chart: /issues/nuclear-weapons/status-world-nuclear-forces/ . This estimate shows that Pakistan has 120-199 nuclear weapons, and the UK and France have about 225-300. But the Pakistani nuclear weapons program is estimated to be growing while the UK and France have stopped producing new nuclear weapons. Production of nuclear weapons is of great concern, but production of highly enriched uranium is even more worrisome. Although a nuclear bomb might be stolen from a country’s stockpile, it would have anti-activation safeguards (such as access codes and electronic locks) that a thief would find very difficult to penetrate. However, highly enriched uranium for a terrorist is like flour for a baker. Each material is simply one ingredient from which something much more impressive can be concocted. Pakistan continues to produce weapons-grade U-235 at a more intense rate than any country in the world. It is reliably estimated that they have stockpiled thousands of pounds of enriched U-235 that could lead to the fabrication of dozens of new nuclear weapons. Eyes continue to focus on Pakistan as a potential source of nuclear bomb material. Yet unsecured highly enriched uranium elsewhere has been a worry for many years. Of particular concern have been the vast amounts of weapons-grade uranium that were left relatively unguarded in Russia, Ukraine, Belarus and Kazakhstan after the break-up of the Soviet Union. These have been potential access points for terrorists. Hundreds of secret bombs could have been fabricated. Prior to 9/11, we could not imagine rogue, non-state entities having the ability to construct a nuclear weapon. Yet vast numbers of reports, documents, drawings and photographs from the Manhattan Project have been declassified. The Little Boy development work at Los Alamos is available for the world to examine. Following 9/11, government agents visited war museums in the United States to remove publicly displayed, artillery-gun components replicating Little Boy. But the proverbial horse was already out of the barn. Conceivably, determined terrorists could acquire 140 pounds of weapons-grade uranium-235, the amount used in the Hiroshima bomb. While a person weighing 140 pounds would fully occupy a seat at a dinner table, 140 pounds of uranium, the densest of all naturally occurring elements, is less than the size of a football.With the material in hand, processing and fabrication steps for constructing a weapon rely on well-established and widely known metallurgical and manufacturing techniques. Who then might do this? Where would construction take place? And under whose leadership? The villain of our hypothetical scenario is the leader of a militant group located in the tribal territory of Northwestern Pakistan.Skeptics may doubt that our protagonist, Gulbuddin Hekmatyar, could obtain the equipment and expertise needed for weaponization of highly enriched uranium. While not on Abercrombie and Kent tourist itineraries, the frontier region of Northwest Pakistan is the site of the colorful village of Darra Adam Khel. This unique tribal enclave near the Khyber Pass, just 20 miles South of Peshawar, has been manufacturing copies of small weapons since the late 19th century using basic lathes, drills and other readily available tools.5)See the video at http://www.downvids.net/light-engineering-in-darra-adam-khel-pakistan-amazig–472252.htm, accessed on May 14, 2014. This YouTube video shows the light manufacturing equipment in Darra Adam Khel with capacity to manufacture a Hiroshima firing unit. During the Mujahideen struggle with the Soviet Union in the 1980s, the United States was not unhappy to see their production of anti-aircraft weapons. Darra Adam Khel is a major source of weapons in the South Asia region. The potential to fabricate the components for a Little Boy clone clearly exists there. Osama bin Laden and other Al Qaeda leaders have been eliminated, but other militant jihadists have the capacity and the will to engage in development and use of a nuclear weapon. We chose Gulbuddin for our scenario because he was involved with the 1993 bombing of the World Trade Center, he controls a formidable belligerent organization with the resources to actualize this sequence of events, and he is not part of Al Qaeda or the Taliban. An Afghan student of engineering at Kabul University in the early 1970s, he organized at that time what was probably the first militant Islamic organization in Afghanistan. His student group shot at and threw acid at women in Kabul who were wearing mini-skirts. In a confrontation in 1972 with the rival Maoist political group on campus, Gulbuddin shot and killed their leader. After being imprisoned, he escaped and was given refuge by Islamic fundamentalist elements of the Pakistani government in 1975. Some officials in Pakistan, which had border region disputes with Afghanistan since its founding in 1947, saw in Gulbuddin a potential ally in future conflicts with Afghanistan. In the early 1980s, when the United States started channeling large amounts of funds and weapons to the Mujahideen for their struggle with the Soviet Union, the Pakistan intelligence agency, the ISI, provided Gulbuddin with a substantial portion of those resources. This enabled the charismatic fanatic to establish a formidable organization known as Hezb-e-Islami. Gulbuddin and his organization did not pursue the Soviets as fully as they might have, since he was waiting to use his fighting potential in a putsch to take over Afghanistan following the departure of the Red Army. He did indeed engage in a civil war for control of Afghanistan that began in 1992. But after achieving the position of Prime Minister of Afghanistan in 1993, Gulbuddin was eventually defeated by the Northern Alliance led by Massoud. With the fall of Gulbuddin, the ISI of Pakistan threw their support in 1994 to the newly organized Taliban. Few are aware of Gulbuddin’s contacts with the perpetrators of the 1993 bombing of the World Trade Center. Those connections and his meetings with the Blind Sheik were revealed in the trials of the World Trade Center bombers held in New York City. It is too often said that the weakening of Al Qaeda ensures the safety of the U.S. from terrorist attack. However, the 1993 bombing of the World Trade Center involved non-Al Qaeda players and leadership figures from that event are still active. This is just one example of a non-Al Qaeda terrorist group that might become a perpetrator of nuclear terrorism. Today, Gulbuddin maintains a militant presence in the frontier region and has the organizational ability to engage in ambitious terrorist actions. Gulbuddin is neither a tribal “war lord” nor a narrowly educated religious militant. He is a sophisticated intellectual and political leader who completed two years of engineering education. There is every indication that he is as vicious a proponent of terrorism as was Osama bin Laden. Nothing suggests that Gulbuddin is, in fact, plotting a nuclear attack on an American city. But he is the key player in our scenario because he has the knowledge, resources and frame of mind for implementing such an attack. If there is one such person and group, there are likely others. The fissile materials available in Pakistan can be fabricated in the Khyber region to serve as components for a gun-type Hiroshima bomb. The amount of radiation released by the highly enriched uranium can be easily shielded and thus easily elude detection at border crossings or from aerial drones. Since suicidal jihadists probably would assemble it, many of the features that were built into Little Boy 69 years ago to ensure safe delivery and controlled detonation could be ignored. While this scenario has focused on terrorism originating in the Afghanistan-Pakistan border area, other scenarios might be equally plausible. In May 2011, the Belfer Center for Science and International Affairs at Harvard University issued a report entitled, “The U.S.-Russia Joint Assessment on Nuclear Terrorism.”7)Belfer Center study is available at http://belfercenter.ksg.harvard.edu/publication/21087/usrussia_joint_threat_assessment_of_nuclear_terrorism.html The study group analyzed possible threats from three terrorist organizations known to have systematically sought to obtain nuclear weapons: Al Qaeda, groups in the Northern Caucasus, and the Japanese cult group, Aum Shinrikyo. Each could be a suitable scenario protagonist. If Iran began producing tens of pounds of HEU, then the possibility of Hezbollah obtaining that material would also merit consideration. Additional scenarios can be hypothesized with sociopaths who are American citizens. Two figures stand out as prototypes with the organizational and technical capacity needed for implementation. One is Timothy McVeigh, whose homemade bomb destroyed the Alfred P. Murrah Federal Building in Oklahoma City on April 19, 1995. The other is Ted Kaczynski, the mathematics genius known as the Unabomber. He perpetrated seventeen explosive attacks killing three people between 1978 and his arrest in 1996. The vulnerabilities of enriched uranium supplies in the United States in the 1970’s were astonishing. We assume that such homeland dangers have been ameliorated. Yet we are aghast at the July 28, 2012, spectacle of an 82-year-old nun and two equally unlikely compatriots penetrating the innermost sanctum of the highly enriched uranium facility at Oak Ridge, Tennessee, and spraying the storage building with graffiti. 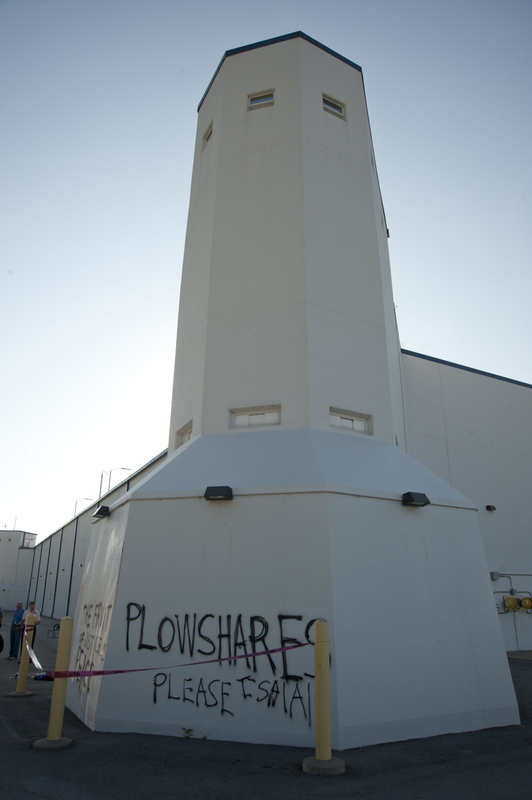 The words they posted said, “Plowshares Please Isaiah.”9)Matthew L. Wald and William J. Broad, “Security Questions are Raised by Break-In at a Nuclear Site,” New York Times, August 7, 2012, http://www.nytimes.com/2012/08/08/us/pacifists-who-broke-into-nuclear-weapon-facility-due-in-court.html and see the following website for the image the protestors made: http://cdn.knoxblogs.com/atomiccity/wp-content/uploads/sites/11/2013/07/heumf-blood.jpg If such lax security is exposed in Bear Creek Valley, U.S.A., what might be the case in Pakistan, Russia, North Korea or China? A successful act of nuclear terrorism would, in a blinding flash, change the nature of civilization, as we know it. When the consequences of an action are so enormous, perhaps one should pause to reflect upon it, even if scenarios and anecdotes may not be persuasive. But our lives are frequently influenced by low probability events. We wear seat belts. We buy lottery tickets. Perhaps we should be more proactive in supporting our government’s actions to ameliorate potential risks. The international community is currently discussing at least three treaties. One is to create uniform legal frameworks for prosecuting terrorists who seek to use nuclear materials, another is to develop uniformly effective security procedures for safeguarding nuclear materials, and the third is the Fissile Material Cut-off Treaty. It is likely that these issues are far more important and could have much greater consequences than some of the actions that might be taken to thwart nuclear weapons development in Iran or North Korea. Nuclear policy priorities need to emphasize non-state weapons proliferation at least at the same level as state-centered weapons proliferation. In the non-government sector, non-state weapons proliferation also should be as central in public forums, the press, blogs, general discourse and academic discussions as the continuing crises in North Korea and in Iran. The fact that the Federal Emergency Management Agency (FEMA) and the Department of Homeland Security are engaging in detailed analyses of emergency responses to a Hiroshima-type bomb detonation in central Washington D.C. means that they are taking that possibility seriously.10)National Capital Region Key Response Planning Factors for the Aftermath of Nuclear Terrorim – November 2011 – FEMA, Homeland Security and Lawrence Livermore National Laboratory, available at /irp/agency/dhs/fema/ncr.pdf While the Gulbuddin scenario chose Las Vegas as a symbolic target, another team of jihadists might choose to focus on our nation’s capital. Today, the news media continually reports about the potential for North Korea to attack the United States with nuclear-tipped intercontinental ballistic missiles. But an attack using a crate holding a lead-shielded, twelve-foot long artillery gun, delivered by sea to one of America’s busiest container ports, such as ports in New Jersey, New York, or California, is a more likely mode of attack and would be equally effective and deadly. Edward A. Friedman is Professor Emeritus of Technology Management at Stevens Institute of Technology in Hoboken, N.J. He holds a B.S. in Physics from MIT and a Ph.D. in Physics from Columbia University. He was director of a USAID program to develop an indigenous college of engineering in Afghanistan (1970-73) when Gulbuddin Hekmatyar was arrested for murder of a political rival at Kabul University. Dr. Friedman was a founder and senior vice president of the Afghanistan Relief Committee (1979-1995). In 2012 he developed and taught a graduate course on Nuclear Weapons in International Relations as an Adjunct Professor at The John C. Whitehead School of Diplomacy and International Relations at Seton Hall University. Roger K. Lewis is an Architect and Planner. He has been a long-term columnist for the Washington Post’s “Shaping the City.” He is Planning and Preservation Trustee for the National Children’s Museum and President and Director of the Peace Corps Commemorative Foundation. His book, “Architect? A Candid Guide to the Profession” is known as the best basic introduction to the profession. He is Professor Emeritus of Architecture at the University of Maryland School of Architecture. 1. ↑ “Nuclear Fuel Memos Expose Wary Dance With Pakistan,” New York Times, November 30, 2010. 4. ↑ See FAS’s world nuclear forces chart: /issues/nuclear-weapons/status-world-nuclear-forces/ . This estimate shows that Pakistan has 120-199 nuclear weapons, and the UK and France have about 225-300. But the Pakistani nuclear weapons program is estimated to be growing while the UK and France have stopped producing new nuclear weapons. 5. ↑ See the video at http://www.downvids.net/light-engineering-in-darra-adam-khel-pakistan-amazig–472252.htm, accessed on May 14, 2014. This YouTube video shows the light manufacturing equipment in Darra Adam Khel with capacity to manufacture a Hiroshima firing unit.